DEFENDING champion Petron has a huge target on its back as the seven other teams go after the Blaze Spikers’ crown in the Philippine Superliga Grand Prix, which opens on Saturday at Ynares Sports Arena in Pasig City. After winning the Grand Prix and All-Filipino Conference, Blaze Spikers head coach Shaq Delos Santos believes that it’s going to be tougher defending their throne after the rest of the teams beefed up their respective rosters. “Lagi naming ipu-push yung sarili namin sa limit namin kung ano yung pwede naming magawa yung kaya naming ishare or ipakita sa lahat,” Delos Santos said during the PSL Grand Prix press conference and fans day on Sunday at the Sta. Lucia East Mall. “Hindi kami pwede maging complacent everyday definitely maghahanda lahat yan, sobrang paghahandaan. Lagi naming bibigay yung one hundred percent," he added. 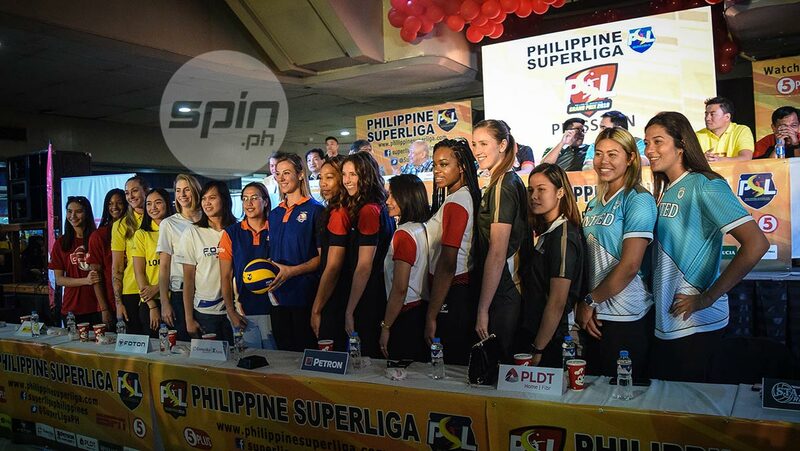 Imports Stephanie Niemer and Katherine Bell will be fueling the repeat bid of Petron joining mainstays Ces Molina, Mika Reyes, Aiza Maizo-Pontillas, All-Filipino Conference MVP Rhea Dimaculangan and new recruit libero Denden Lazaro. Niemer is seeking to complete unfinished business with Petron in her return since losing to a Foton side led by Jaja Santiago and former import Lindsay Stalzer in the 2016 Grand Prix, while Bell tries to replicate what she won last season. But defending their throne won’t be a walk in a park as the Petron coach is bracing for tough opponents this season especially rival F2 Logistics, which will turn to Petron’s former import and reigning Grand Prix MVP Lindsay Stalzer. Stalzer, who's finishing a tournament in Thailand, will join American-Italian Becky Perry in boosting the Ramil de Jesus-coached team bannered by Aby Maraño, Cha Cruz-Behag, Kim Fajardo, Ara Galang, Kianna Dy, Majoy Baron, and Dawn Macandili. Foton, the two-time champion which will be missing the services of towering sisters Jaja Santiago and Dindin Manabat, will rely on former Turkish national team member Selime Ilyasoglu and American Courtney Felinski. Last All-Filipino Conference bronze medalist Generika-Ayala will parade Azerbaijan national team star Kseniya Kocyigit and Brazilian stalwart Nikolle del Rio. Cignal will be banking on Anastasia Artemeva of Azerbaijan and Erica Wilson of the United States, joining skipper Rachel Anne Daquis and Mylene Paat. Two new coaches will also make their PSL debuts as team official-turned-head coach Joshua Ylaya, who replaced Moro Branislav, will call the shots for United Volleyball Club led by Fil-Am Kalei Mau and new recruits Alohi Robins-Hardy, Amy Ahomiro, and Bang Pineda with imports Tai Manu-Olevao and Yasmeen Bedart-Ghani. Babes Castillo will lead the Lady Realtors bannered by NCAA Division I standouts Molly Lohman and Casey Schoenlein as well as locals Jho Maraguinot, MJ Phillips, Rebecca Rivera, and new recruit Amanda Villanueva. PLDT, which used to be known as Smart, will make a return with head coach Roger Gorayeb having imports Grace Lazard and Kendra Dahlke and two former NCAA MVPs Grethcel Soltones and Shola Alvarez.